Southern Utah University’s Department of Music will present two days of ensemble concerts during the first week of November. The SUU Piano and String Ensembles perform Monday, November 5, 2018, followed by the SUU Brass and Woodwind Ensembles on Tuesday, November 6, 2018. Both performances will be in the SUU Music Building’s Thorley Recital Hall at 7:30 p.m. Admission is free and open to the public. 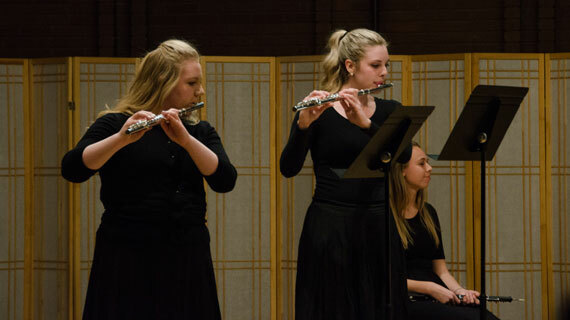 Dr. Lawrence Johnson, Chair of the Department of Music at SUU, shares, "The small ensembles of the SUU Department of Music afford more opportunities for our talented students to show off their skills and musicianship in ways that large ensembles may not. Not only does the limelight focus more directly on these individual instrumentalists in smaller groups, but it also provides a chance to delve deeper into the chamber music works and share these gems composed by the masters of today and throughout music's treasured history. We hope you enjoy experiencing these more intimate performances as we showcase our dedicated music students!" The Piano and String Ensembles Concert will be held on Monday, November 5, 2018. This concert will highlight the work of students who dedicate their talents to the piano, viola, violin, cello, and bass. The Brass and Woodwind Ensembles Concert will be held on Tuesday, November 6, 2018. This concert will highlight the work of students who dedicate their talents to the saxophone, oboe, flute, clarinet, and bassoon. Kamron Campbell, SUU saxophone student, says, “My favorite part about preparing for this concert has been the progress of the ensemble as a whole. We work really hard and it’s nice to see our improvement each week. Support these dedicated performers in their respective concerts on November 5 and 6, 2018. For more information about the SUU College of Performing and Visual Arts’ Department of Music, please visit the SUU Department of Music website.